Surgical bleeding can be associated with an increased risk of morbidity and mortality across all surgical areas. Thus, to avoid complications related to excessive bleeding, numerous products have been developed to achieve hemostasis. The thorough knowledge of these hemostatic measures is required for good results. The aim of the study is to compare the different methods to control bleeding in oral and maxillofacial surgery. An extensive systematic literature search was performed in PubMed, Google search using combination of keywords such as bleeding, bleeding control methods, oral surgery, Gelfoam, vasoconstrictors, Chitosan, Floseal, haemcoagulase, Gelatin Sponge, Suturing, and Cautery. The inclusion criteria for the study were articles in English, articles published between January 1, 1990 to June 30, 2016, studies that provide information about bleeding control procedures, complications during head, neck, and face surgery procedures and hemostatic agent and articles based on observational studies and original articles. Exclusion criteria for the study were studies that provided inadequate information, systemic review, research papers, case reports, letters to editor and studies based on animals other than human beings. Total 11 articles were selected for the analysis which included head, face, and neck procedures with/without using bleeding control measures such as pressure application, suturing, cautery, ligation of blood vessel, application of Ankaferd blood stopper, chitosan, Floseal®, thrombin–gelatin matrix (Tissel®)/fibrin glue, Gelfoam, and tranexamic acid. Conventional methods are insufficient to control extensive bleeding. However, newer methods or combinations of these methods are required to achieve adequate hemostasis. All hemostatic measures were not covered in this review. Surgery concerned with the treatment of disease, trauma, or deformity by physical operation or manipulation. Oral and maxillofacial surgery is the specialized branch for treatment of many diseases, injuries, and defects in the head, neck, face, and jaw regions. The major steps included in surgery are incision, dissection, exposure, resection, hemostasis, restoring anatomy, and closure. All surgical procedures come with a risk of complications which may include pain, nerve injury, swelling, excessive bleeding (hemorrhage), and infections. Excessive bleeding complicates surgery and often leads to longer hospital stays, increased health-care service utilization and higher health-care costs, and other negative consequences. Loss of blood beyond a certain limit is potentially life-threatening and may lead to death. Therefore, the loss of blood during surgery should be minimized by achieving hemostasis. Hemostasis can be achieved using different hemostatic methods such as mechanical, thermal/energy-based, chemical (pharmacological-based) methods. Conventional methods for control of bleeding include electrocautery, suturing, manual compression, or ligatures. While some newer hemostatic agents such as vegetal-origin (Surgicel, Hemotase), fibrin sealants such as Tachosil or Tisseel, different sponge products such as only composed of gelatin (Gelfoam), or more specific techniques such as polyvinyl alcohol sponge (Merocel) can also be used. Which are the different methods to control bleeding during oral surgical procedures? S: Studies included - Observational/clinical studies. In vivo studies including observational studies and original articles were included in the study. Studies published in other than English language were excluded from the study. An extensive systematic literature search was performed in PubMed and Google. Manually journals were searched in the institution library. Search using combinations of keywords was undertaken. A comprehensive search of the literature was undertaken through PubMed, Google search, and institution library. 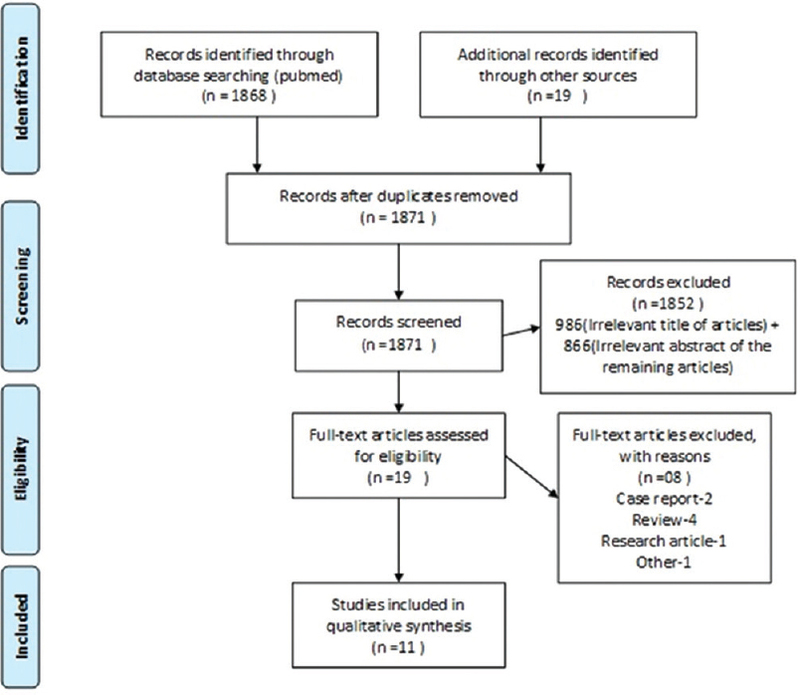 Details of the searches performed in PubMed were using filters such as free full text, published between January 1, 1990, and June 31, 2016, human studies [Table 1]. Google search is done by entering keywords such as bleeding, bleeding control methods, oral surgery, Gelfoam, vasoconstrictors, Chitosan, Floseal, Haemcoagulase, Gelatin Sponge, Suturing, and Cautery in search bar. Manual search and electronic search are performed in institutional library to find relevant articles. All the citations from the above searches were combined in an electronic spreadsheet. Total 1887 articles were found out of which 1868 articles were from PubMed, and from other sources, we found 19 more articles. From all these articles, 1871 articles were selected after removing the duplicates. Out of which, 986 irrelevant articles were excluded after going through name of the articles. In later stage, 866 articles were excluded after screening abstract of the selected 885 articles. Finally, after screening the full text of remaining 19 records, we got 11 articles which were completely satisfying the eligibility criteria [Table 1]. A standard pilot form for data extraction was provided to the expert. Only the appropriate data items for the present review were retained and entry for one article was done. The expert checked and approved the data items, and then, data extraction sheet was finalized. Then, data from included studies were extracted and tabulated in an electronic spreadsheet (excel sheet). This was individually done and later checked by the guide. Total 11 articles were selected for the analysis which included head, face, and neck procedures with/without using bleeding control measures. Out of which, 4 articles were contained only extractions, 4 articles were contained minor oral surgery or periodontal surgery, and 3 articles were contained major head, neck, and face surgeries. The data of interest were as follows: name of the article, author name, location, year of publication, study design, sample size, settings, population, procedure, intervention/exposure, comparison intervention if any, outcome, complications, and remarks. [Figure 1] and [Illustration 1]. Bleeding at the surgical site is very disturbing both for the patient and the surgeon. Extensive blood loss during oral surgery can cause hypovolemia which may convert into hypovolemic shock and can lead to death. To avoid such complication, prevention of blood loss during surgery is very essential. Several conventional hemostatic techniques are used to minimize blood loss. Mechanical methods include manual pressure, ligature, and the application of a tourniquet. However, these methods can be intensive and time-consuming. Sealing of bleeding vessels can also be achieved by thermal methods such as electrocauterization or laser cauterization, but these methods can create areas of char and necrosis of tissue, increasing the possibilities of infection, and damaging wound edge which can be lead to impaired healing. Conventional methods are also less effective for bleeding control in complex injuries and where accessibility to the area of bleeding is difficult. Therefore, the use of newer hemostatic agents is required. Hence, in this review, we have studied various hemostatic methods to control bleeding. Majumder et al. studied the efficacy topical application of hemocoagulase in 2014. They showed the use of hemocoagulase after the minor oral surgery provides faster hemostasis as well as it enhanced healing by rapid formation of healthy tissue so lesser the chances of infection over other conventional methods of bleeding control. Ujam et al. studied about the use and safety of Floseal in head and neck surgeries in 2012. Floseal consisted of two products (a gelatin matrix and a dehydrated topical thrombin) which were mixed during surgery, immediately before use. The final material was not only excellent at conforming to irregular surgical cavities but also helped in clot formation in the presence of thrombin. Their findings provided evidence for the safe, routine use of Floseal in common head and neck surgeries procedures. Beyazit et al. studied about the efficacy and safety of Ankaferd blood stopper (ABS) over bleeding control during dental procedures in healthy and impaired hemostatic patients in 2011. It contains mixture of the plants Thymus vulgaris, Vitis vinifera, Glycyrrhiza glabra, Alpinia officinarum, and Urtica dioica. It represented its unique hemostatic effect by inducing a very rapid (<1 second) structure of protein network, which acted as an anchor for vital physiological erythrocyte aggregation, covering the classical cascade model of the clotting system without disturbing individual coagulation factor and platelets. They found that ABS had high hemostatic efficiency in prolonged dental bleedings. This herbal hemostatic agent (ABS) had reduced not only the need for additional medications and interventions but also the cost of the treatment. Fiss et al. studied about the efficacy of gelatin–thrombin matrix in 2007. This matrix consisted of bovine gelatin which had extremely low immunogenicity. It is a safer method of hemostasis as it has a history of more than 1.5 million applications in all surgical specialties except ophthalmology. It could easier to apply in regions with poor accessibility and also the consistency of the material provided more tissue contact than thrombin-soaked gelatin sponge. Kim et al. studied about the incidence of complications after mandibular third molar surgery and to predicted the risk of skin ecchymosis or mucosal petechiae related to the usage of an absorbable gelatin sponge in 2006. Insertion of absorbable gelatin sponge to the extraction socket was found to be a very useful method to prevent postoperative mucosal petechiae and skin ecchymosis. Therefore, routine usage of the absorbable gelatin sponge was strongly encouraged by the author during the mandibular third molar surgery. Morimoto et al. studied about the risk factors affecting the onset of postoperative hemorrhage after tooth extraction in patients receiving oral antithrombotic therapy and increased international normalized ratio (INR) values. They found that local hemostatic measures were required in many patients continuing warfarin therapy. They may required hematoma removal, compression, oxidized cellulose insertion, and resuturing, electrocautery, and/or splinting during surgical procedures. Al-Mubarak et al. studied consequences of temporary withdrawal of warfarin and/or suturing on bleeding and healing pattern following dental extractions in 2007. Their results showed that suturing did not play any significant role in bleeding control. Contrary to expectation, Group 3 (−W+S) and 4 (+W+S) patients had higher (but insignificant) incidences of bleeding than their respective controls, Group 1 (−W−S) and 2 (−W+S). This could be due to trauma to the tissue while suturing and improper tissue handling which might complicate tissue healing and wound closure. Therefore, it was suggested by the author that suturing and invasive manipulation of soft tissue should be avoided in simple extractions and administered only when it is required. This study concluded that dental extractions can be safely performed in patients on warfarin therapy without stopping or altering the dose of anticoagulant, provided that the INR is ≤3.0 and effective local hemostatic method should be ensured and depending on the extent of surgical trauma and the nature of wound suturing could be done. Amer et al. evaluated the correlation between INR values and the sufficiency of two different local hemostatic measures (ABS and tranexamic acid) in controlling postextraction bleeding in anticoagulated patients in 2014. In this study, the incidence of postoperative bleeding following the use of local hemostatic agents were 12.5% and 10% in Group 2 (tranexamic acid) and Group 3 (ABS), respectively. Based on their findings, ABS was an effective hemostatic agent comparable to tranexamic acid in controlling postextraction bleeding in oral anticoagulant therapy patients of INR values ≤3. Chung et al. evaluated the effect of newly developed chitosan gel (8% carboxymethyl chitosan, Surgi shield) on hemostasis and wound healing after endoscopic sinus surgery (ESS). It is a natural polymer obtained from chitin found in many natural sources including the cell walls of fungi, the exoskeletons of arthropods such as crustaceans (e.g. crabs, lobsters, and shrimps) and insects, the radulae of mollusks, and the beaks and internal shells of squid and octopuses. It had a low toxicity as well as it is inert in the gastrointestinal tract of mammals. Surgi shield containing chitosan significantly reduced postoperative hematoma formation and achieved rapid hemostasis immediately after ESS without any adverse effects. Manimegalai  in 2010 evaluated the efficacy of fibrin adhesive sealant (Tisseel), a human biological tissue adhesive, as compared to conventional suture placement in pocket elimination and mucogingival surgical procedures. This study showed postoperative bleeding in mucogingival surgeries which was reduced more effectively after application of Tisseel than suturing. Sutures caused inflammation around them and also accumulate food and plaque. Tisseel also showed ideal bioadhesive qualities for fixing of flap. It was easier and quicker material to use and also reduces surgical time considerably. It also was helped in reducing pocket depth. Blinder et al. evaluated postoperative bleeding in patients with oral anticoagulant therapy and who underwent dental extractions without interruption of the therapy. They compared the effect of different hemostatic modalities among three groups. The study showed that the local hemostasis with resorbable gelatin sponge, fibrin glue, and sutures was not more efficient than local hemostasis with resorbable gelatin sponge and sutures alone or resorbable gelatin sponge, sutures, and mouthwash with tranexamic acid. All the studies included in this review are hospital based indicating that hemostasis management is still a complication which needs to be handled in hospital. The mean age of patients in this study was 20–40 years. One study conducted in Japan by Morimoto et al. had a patient below 10 years and another one was above 90 years. The procedure in 5 settings were dental extractions, 2 settings were minor oral surgery, 1 periodontal surgery, 1 head and neck surgery, and 1 of intracranial neurosurgical procedure.,,,,,,,,,, This clearly shows that the chance of bleeding is high after dental extraction procedure among head and surgery. The hemostatic agents used in these studies varied considerably, including hemocoagulase application, Floseal ®, ABS, gelatin–thrombin matrix, absorbable gelatin sponge, pressure pack, suturing, pressure pack with tranexamic acid, Merocel, and Tisseel ®.,,,,,,,,,, This clearly shows that there is no standard hemostatic used all over the world. Various authors recommended various hemostatic agents. Majumder et al. found the use of hemocoagulase after the minor oral surgery not only provides faster hemostasis but also enhances healing by rapid formation of healthy tissue and less chances of infection. Ujam et al. said that in HNS procedures, Floseal ® was a safe hemostatic material to use for control of bleeding. Beyazit et al. found that ABS had high efficiency of bleeding control with protein network formation with anti-infective and healing modulatory properties. Fiss et al. recommended gelatin–thrombin matrix as it is an effective, easy to use, and readily available hemostatic agent. They also found that combination with fibrinogen was required in special situations. Kim et al. said that the insertion of an absorbable gelatin sponge into the extraction socket was a very useful method to prevent postoperative bleeding problems. As Yoshinari Morimoto et al. found that more than 90% of cases receiving warfarin therapy, postoperative hemorrhage occurred within 6 days of extraction. Therefore, thorough local hemostatic measures required in these patients. Al-Mubarak et al. showed that dental extractions can be safely performed for patients on anticoagulation therapy; provided that the INR level is kept ≤3.0 using effective measures of local hemostasis are administered. Based on their findings, Amer et al. found that ABS was a hemostatic agent of good efficacy. Chung et al. found that complete hemostasis could rapidly achieved with the Surgi shield containing chitosan applied side. Manimegalai found that the fibrin adhesive system (FAS) showed superior results in all the parameters measured, i.e. hemostasis, fixation of tissues, reduction in plaque and gingival index, and probing depth postoperatively. Blinder et al. said that local hemostasis with gelatin sponge and sutures was sufficient in patients undergoing extractions without discontinuing anticoagulant therapy. Moreover, as confirmed by all the studies, many newer methods are more superior than conventional methods as well as they can be easily applied. Gelatin–thrombin matrix is one of the superior methods as it can achieve hemostasis earlier in extensive bleeding areas and can be used in inaccessible areas as well as no complications are reported by use of it. Floseal can be another option of hemostasis in major surgeries. FAS (Tisseel ®)/fibrin glue, hemocoagulase, ABS, tranexamic acid, and gelatin sponges are other methods of hemostasis which can be recommended during minor surgeries. Out of which, Tisseel ® can be good method of hemostasis as it promotes healing by good adhesion and reduces incidence of infection over suturing and necrosis of tissue due to the use of cautery, but the only drawback of the material is the higher price. Hemocoagulase, tranexamic acid, and gelatin sponge can be used in minor surgeries safely. We cannot recommend ABS as it showed some temporary complications such as metallic taste, numbness over the site, dirty white patches as well as it did not show major significant effect over other hemostatic method such as tranexamic acid. Chitosan another material can be used for hemostasis during regular surgeries, but more studies are not available which are recommending reliability of the material. When lesser bleeding present conventional methods like pressure application, suturing, and cauterization can be used during surgeries and in complicated cases when other advanced options are not available they conventional methods can be used in combinations. The use of antiplatelet drugs and INR values also plays a great role in bleeding. We can conclude extractions, and minor surgeries can be performed with continuing use of antiplatelet drugs and INR values are <3, provided that good regimen of hemostasis materials are available in case of any complications. Bleeding control is one of the important steps in oral and maxillofacial surgery. To achieve haemostasis, various conventional methods like pressure application, suturing, cautery and ligation of blood vessel are used. Sometimes, conventional methods of hemostasis are not sufficient, especially while performing extensive surgeries, surgeries of patients with bleeding disorders, or patients on anticoagulation drug therapy. In such cases, hemostasis can be achieved using newer methods such as topical application of different agents such as ABS, chitosan, Floseal ®, thrombin–gelatin matrix (Tisseel ®)/fibrin glue, Gelfoam, and tranexamic acid. Extensive blood flow can be controlled by combinations of various conventional and newer methods. Finally, we can be recommend that gelatin–thrombin matrix is good method for higher inaccessible bleeding areas while gelatin sponge (Gelfoam), Floseal ®, fibrin glue/Tisseel ®, and tranexamic acid can also be used independently or in combinations with conventional methods. The review contains articles only related to head, neck, and face surgeries. All hemostatic measures are not covered. Price and source of product availability are not mentioned for all hemostatic agents. Studies for definite management of excessive bleeding are required. More research required about hemostatic agents which will have more effective action and lesser complications, which can also use in inaccessible areas. Ease in availability and cost-effectiveness of agents should also be considered during research. Echave M, Oyagüez I, Casado MA. 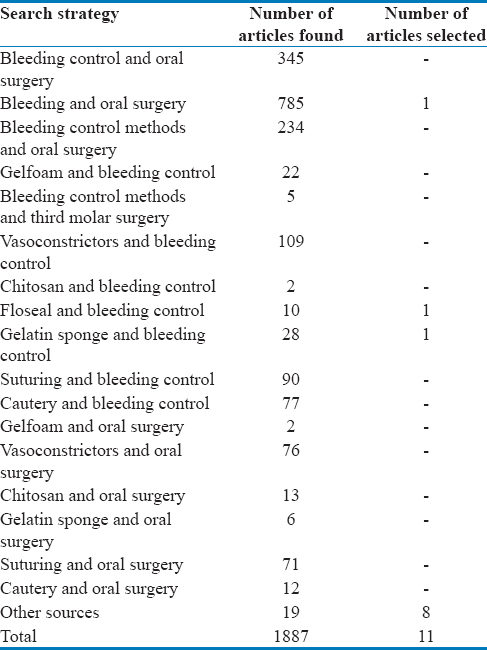 Use of floseal®, a human gelatine-thrombin matrix sealant, in surgery: A systematic review. BMC Surg 2014;14:111. Stokes ME, Ye X, Shah M, Mercaldi K, Reynolds MW, Rupnow MF, et al. Impact of bleeding-related complications and/or blood product transfusions on hospital costs in inpatient surgical patients. BMC Health Serv Res 2011;11:135. Zwischenberger JB, Brunston RL Jr., Swann JR, Conti VR. Comparison of two topical collagen-based hemostatic sponges during cardiothoracic procedures. J Invest Surg 1999;12:101-6. Tan SR, Tope WD. Effectiveness of microporous polysaccharide hemospheres for achieving hemostasis in mohs micrographic surgery. Dermatol Surg 2004;30:908-14. Majumder K, Shalender J, Rao D, Gehlot N, Arya V, Siwach V. Efficacy of haemocoagulase as a topical haemostatic agent after minor oral surgical procedures – A prospective study. Int J Clin Med 2014;5:875-83. Ujam A, Awad Z, Wong G, Tatla T, Farrell R. Safety trial of Floseal(®) haemostatic agent in head and neck surgery. Ann R Coll Surg Engl 2012;94:336-9. Beyazit Y, Kart T, Kuscu A, Arslan A, Kurt M, Aktas B, et al. Successful management of bleeding after dental procedures with application of blood stopper: A single center prospective trial. J Contemp Dent Pract 2011;12:379-84. Fiss I, Danne M, Stendel R. Use of gelatin-thrombin matrix hemostatic sealant in cranial neurosurgery. Neurol Med Chir (Tokyo) 2007;47:462-7. Kim JC, Choi SS, Wang SJ, Kim SG. Minor complications after mandibular third molar surgery: Type, incidence, and possible prevention. Oral Surg Oral Med Oral Pathol Oral Radiol Endod 2006;102:4-11. Morimoto Y, Niwa H, Minematsu K. Risk factors affecting postoperative hemorrhage after tooth extraction in patients receiving oral antithrombotic therapy. J Oral Maxillofac Surg 2011;69:1550-6. Al-Mubarak S, Al-Ali N, Abou-Rass M, Al-Sohail A, Robert A, Al-Zoman K, et al. Evaluation of dental extractions, suturing and INR on postoperative bleeding of patients maintained on oral anticoagulant therapy. Br Dent J 2007;203:15. Amer MZ, Mourad SI, Salem AS, Abdelfadil E. Correlation between International Normalized Ratio values and sufficiency of two different local hemostatic measures in anticoagulated patients. Eur J Dent 2014;8:475-80. Chung YJ, An SY, Yeon JY, Shim WS, Mo JH. Effect of a chitosan gel on hemostasis and prevention of adhesion after endoscopic sinus surgery. Clin Exp Otorhinolaryngol 2016;9:143-9. Manimegalai AG. A comparative study on the efficacy of a commercial fibrin adhesive (Tisseel) vis-à -vis silk suture on wound closure following periodontal surgical procedures. J Indian Soc Periodontol 2010;14:231-5. Blinder D, Manor Y, Martinowitz U, Taicher S, Hashomer T. Dental extractions in patients maintained on continued oral anticoagulant: Comparison of local hemostatic modalities. Oral Surg Oral Med Oral Pathol Oral Radiol Endod 1999;88:137-40.